In looking at the competing ideological trends in the Islamic State, one will quickly see that there is a 'war of narratives' between the 'dissenting' and 'extremist' trends in particular. According to the 'dissenters', the 'extremists' wield too much influence in the Islamic State, whereas the 'extremists' argue that their side (composed of the true 'monotheists') has been persecuted and marginalized within the organization. Both sides are able to draw on particular data points to support their conclusions. For instance, the 'dissenters' were champions of a Jordanian scholar in the Islamic State called Abu Ya'qub al-Maqdisi. As reported by the 'dissenting' outlet Mu'assasat al-Turath al-Ilmi, Maqdisi was executed by the Islamic State. But the 'extremist' side can also claim its own 'martyrs'. 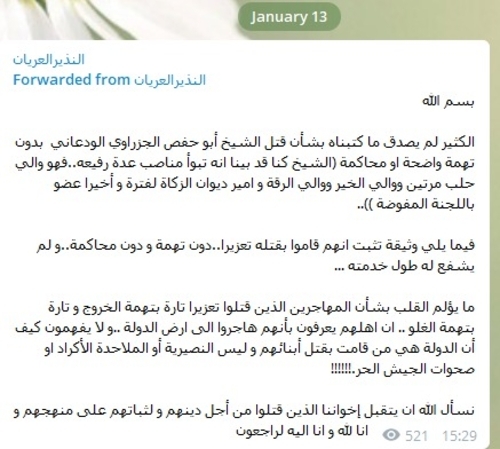 For example, the 'extremist' channel al-Nadhir al-Uryan recently leaked a document that confirms the Islamic State's execution of Abu Hafs al-Jazrawi, a Saudi member of the Islamic State who was despised by the 'dissenters' for his 'extremism'. Jazrawi apparently held a number of important positions in the Islamic State. Most notably, according to al-Nadhir al-Uryan, he was twice wali (provincial governor) of Aleppo. He was also at various points the wali of al-Khayr (Deir az-Zor province), the wali of Raqqa and the amir of of the Zakat department. Lastly, he was a member of the Delegated Committee (a general governing body of the Islamic State). As I have noted multiple times before, in September 2017 the Islamic State's Delegated Committee retracted its controversial May 2017 statement that was seen by the 'dissenting' trend and the scholars they champion as a move in the direction of the extremists. It was also in September 2017 that reports of arrests of 'extremists' began to emerge, Abu Hafs al-Jazrawi being one of them. 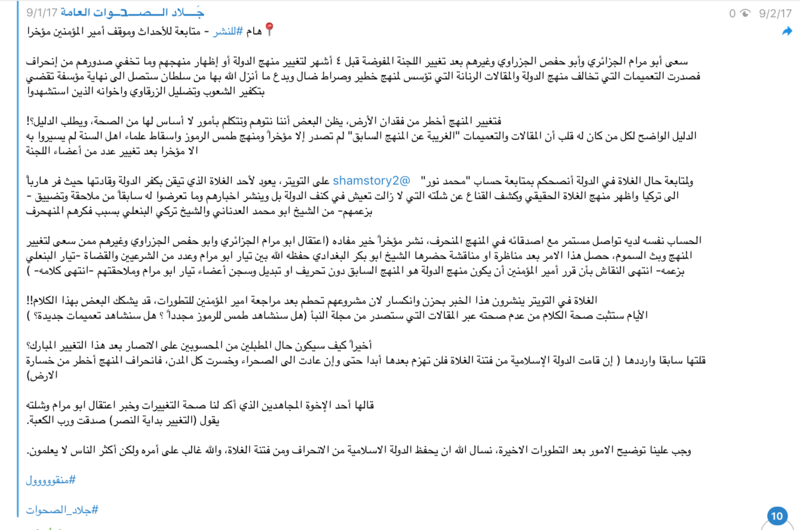 "What pains the heart regarding the muhajireen who were killed in rebuke, sometimes on accusation of revolt or sometimes on accusation of extremism, is that their family know that they migrated to the land of the Dawla [Islamic State], and they do not understand how the Dawla is the one that killed their sons and not the Nusayris, Kurdish atheists or Sahwat of the Free Army!!!! We ask God to accept our brothers who were killed for the sake of their religion and for their steadfastness on their manhaj and we belong to God and to Him do we return." 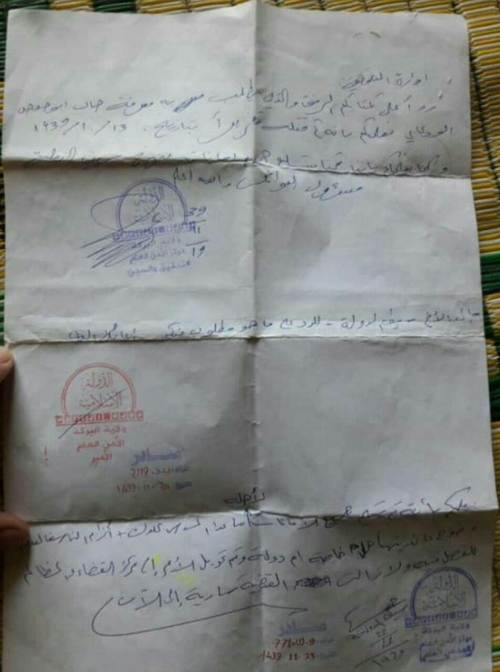 Below is the document that al-Nadhir al-Uryan leaked. I have translated it in full. Admittedly the photo quality, lighting and handwriting do not make the whole text of the document clear. Any parenthetical insertions of my own are in square brackets, while [?] indicates a portion of the original text that was not entirely clear for me to read on account of the photo quality, lighting and handwriting. In response to your letter attached in which you demand to know the state of Abu Hafs al-Wad'ani [another kunya of Abu Hafs al-Jazrawi], we inform you that he was killed in reprimand on date 13 Shawwal 1439 AH [c. 27 June 2018 CE], just as we inform you that all his amanat [items held in trust] were handed over by Sayf al-Dawla the families official and God knows best. We inform you that all the amanat [items held in trust] were handed over to his family except the Glock pistol and explosive belt for lack of clarity of their belonging among them [? ], in particular Umm Dawla, and al-Umm has been referred to the Qada and Madhalim centre for judgement on it and the case is ongoing as of now.